Henry wasn't messing around, Katrina was in some serious trouble this week on Sleepy Hollow Season 2 Episode 7. Giving birth to Moloch... What?!? For a second there I thought Ichabod might lose his precious Katrina, but luckily Benjamin Franklin came to the rescue once again. Was the plan to get Moloch's essence in that jar all along? I'd like to start by saying I'm glad the Jincan thing wasn't drawn out over several episodes. Nice job writers! 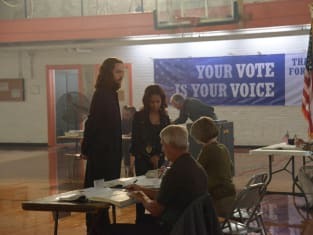 The opening scene was terribly important because it gave us a chance to appreciate Ichabod and Katrina as a couple before all this madness started. For most of the series he's talked about how much he loves her, but it's been tough to connect with them as a couple. I mean with Icky battling demons and Kat stuck in purgatory and now playing house with Headless it's no wonder there are so many Ichabbie shippers out there. Ichabod: This war will end. A story we tell our children when we're old. Katrina: And what will our children be like? Ichabod: Our boys will be strapping young lads and our girls will be enchantresses like their mother. Permalink: And what will our children be like? Wishful thinking, eh? How could they know their son would grow up to be the Horseman of War? Speaking of Henry, he certainly put Abraham in his place this week. Apparently War is more powerful than Death. Shine some light on Headless and he's out for the count. The voting bit was amusing, but probably a bit too light considering the subject matter of the installment. The two scenes connected nicely, though, when the officer mentioned they picked up a red head in full Colonial getup. I wonder who that could be? I've tried various healing incantations but this is unlike any sickness I've ever seen. Henry expected this illness. He said that Moloch has a new purpose for me. Permalink: Henry expected this illness. He said that Moloch has a new purpose for me. How about that Goth chick's clothes? Ichabod was uncomfortable, but even he couldn't deny he liked Kat's new look. It's always fun when the characters from Colonial times are given modern clothes. Skinny jeans might not work for Ichabod, but Kat pulled off her new look with flying colors. I found it interesting that Ichabod was jealous that Kat can now see Abraham's head. His trust in her is shaky due to all the lies, so I guess it made some sense. We learned the Goat's head symbol belongs to the Hellfire Club, a really evil organization. Is this where the Hellfire Shard mentioned comes from? It was pretty ballsy of Abbie to sneak into the Hellfire Club's lab, but why are the bad guys always so clueless? She easily managed to swipe a fairly important book. Hey they left it out in the open; finders keepers and all that jazz. Ichabod: Katrina you're not ill.
Permalink: Katrina you're not ill. I couldn't believe Icky thought Headless was responsible for the pregnancy. That was a low blow even for a jealous husband. Luckily it didn't take long for them to figure out the Jincan was the cause. Is Katrina being naive thinking Henry can be redeemed? She blames Moloch not Henry, but their spawn is pretty far gone. I loved that Abbie put them both in their place. This is the freakin' Horseman of War we're talking about people! Though they attempted to appeal to Henry's human side, I knew he wasn't going to budge. John Noble is so damn evil in this role, I've completely forgotten his wacky and kind Walter Bishop from Fringe; no traces of that guy here at all. Henry: Don't say no, say rise. Rise my horrid King, rise Moloch. Katrina: The demon inside of me. Permalink: Don't say no, say rise. Rise my horrid King, rise Moloch. When Katrina suggested killing her to stop Moloch I had to wonder if we would we miss her. Her loss would be devastating for Ichabod, but I'm not sure it would bother the audience much. We don't want Ichabod to suffer though, so at least for now I'm glad Katrina survived. Did the vision of Jeremy running through the woods really give Ichabod hope? Though he chose Moloch over his estranged parents, is War redeemable? I'm honestly not sure he is at this point. It surprised me that Sheriff Reyes had a part to play in all this, but it was a nice turn of events. It's about time that character made some kind of a difference. I still don't like her, but at least she helped out this week. So Franklin saves the day again! I didn't get the whole aurora borealis thing and why reproducing that phenomena stopped Moloch. Can anyone fill me in? The show gave us the standard creature-ripping-through-the-belly scene and somehow miraculously the aurora borealis prism thingy worked. I guess not questioning the specifics too much and suspending disbelief is the best way to enjoy Sleepy Hollow. It was an entertaining episode and in the end that's what counts. I'll fist bump to that! Well, what did you think of "Deliverance"? Is Moloch's spirit in the jar? Was that Henry's plan all along? Your turn guys, hit the comments below and share your thoughts on this week's installment. Look for our Sleepy Hollow round table later this week. Want to see that craziness again? 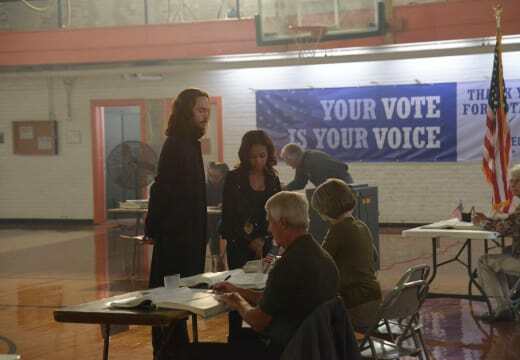 Remember you can watch Sleepy Hollow online right here via TV Fanatic!